“We’re taking the power away from the word “whore” and reclaiming it,” Nadia Napreychikov said. “The reason we use these words is because they are labels reserved for women only so we literally made labels out of them.” Along with her Discount Universe co-founder Cami James, Nadia just unleashed the chaotic array of bright colors, skin-baring designs, and embroidered callous terms towards women that is their SS19 collection. The collection explores the commercialization of feminism and contrasts that with the objectification of the female body, placing a satirical view upon both notions. “As two women in business trying to do our thing for a really long time now, we try and just pick up and move on with the way that we work, so let’s express that anguish,” Nadia said. The Discount Universe womenswear collection, sported on the runway by both female and male models (“There shouldn’t be such a gender segregation in general. We just thought it would make sense to show certain pieces on men,” Cami said. 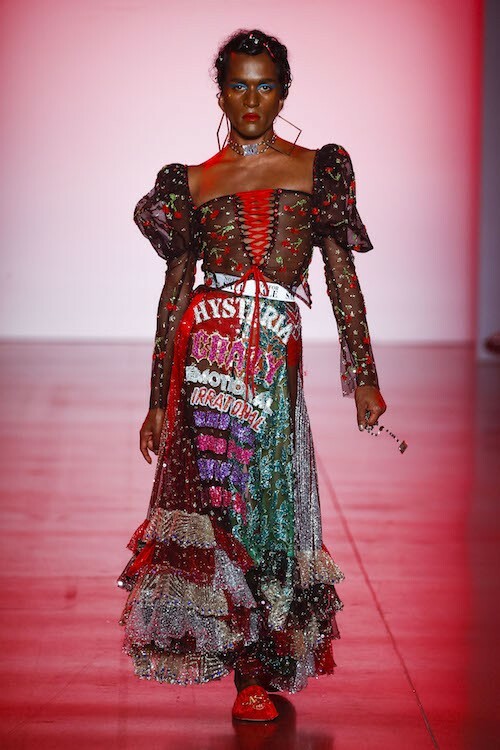 ), offered a slew of woven labels with words such as “HYSTERICAL,” “WHORE,” “SASSY,” “EMOTIONAL,” “CRAZY,” and “IRRATIONAL” over brightly colored patterns, attention-grabbing cuts, squared necklines, lace-up leather trousers, thong jeans, prominent shoulders, and just about every architecturally designed shape and outrageous trend in between. 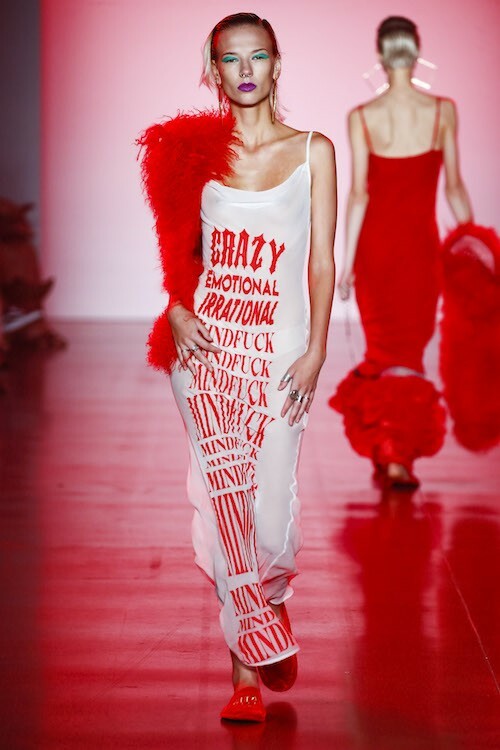 After the show, Cami pointed out that the wording was woven on as a label, to literally turn the misogynistic undertones of labels that have been placed on women into female-empowered fashion. Another interesting point: models wore slide slippers, just about the farthest thing from stilettos, which many believe were invented for the benefit of the male gaze. 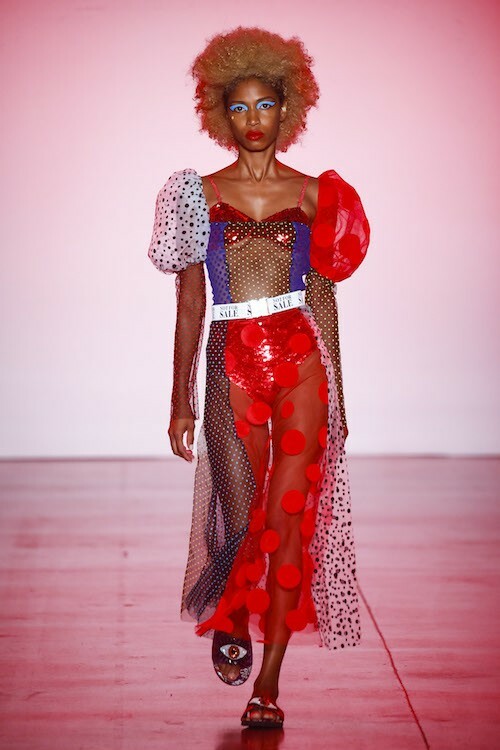 Nadia and Cami chose this collection as their debut to New York Fashion Week, as Discount Universe has always marched to the beat of its own drum. Typically, the brand has released “small, erratic collections, sometimes even of one, or no garments.” So it makes sense that it took the cult-favorite brand about nine years since its launch to join a fashion week schedule. And their decision to show in New York rather than their native Australia was strategic.